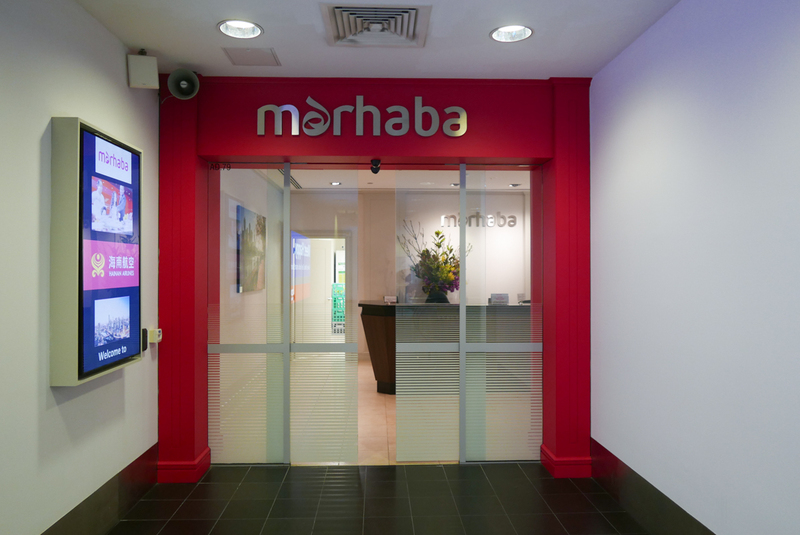 The independently operated Marhaba lounge occupies one of the best real estate positions in Melbourne Airport. 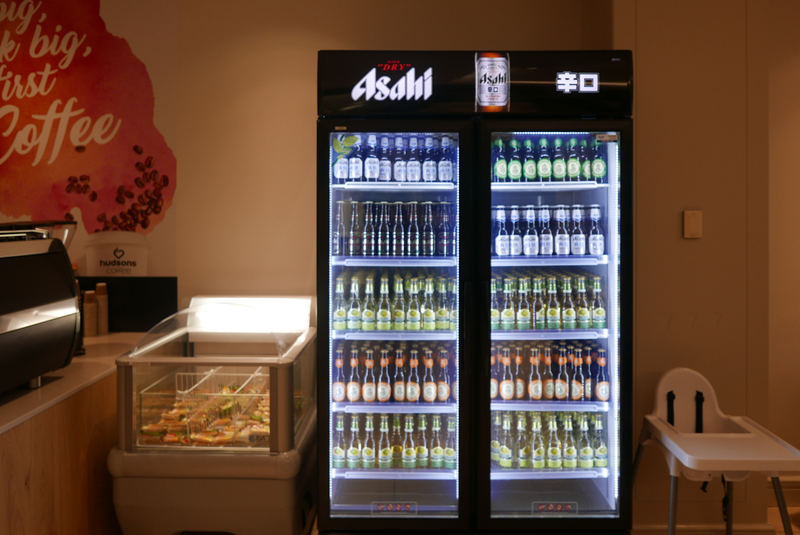 It offers barista service and impressive dining options, and for those of you who love Japanese beer, then you are in for a treat. 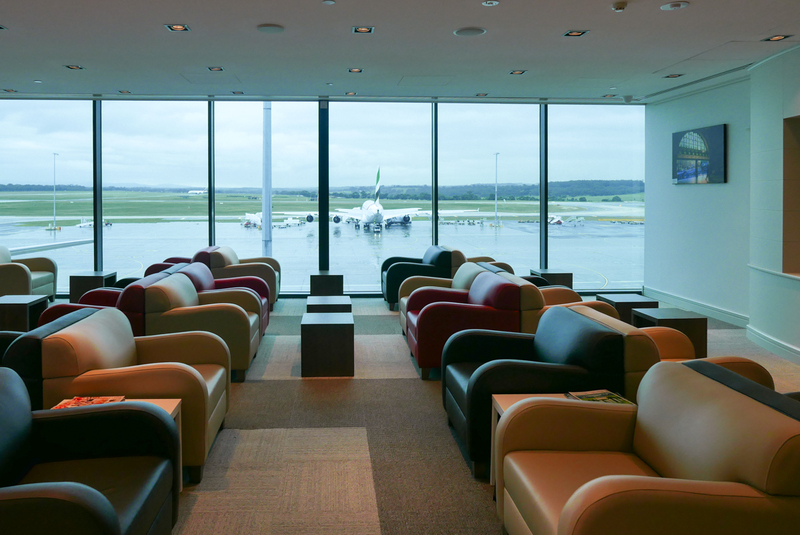 The lounge is located at Level 3 of Melbourne Airport’s Terminal 2 and can be accessed via the escalators near Gates 10 and 11. 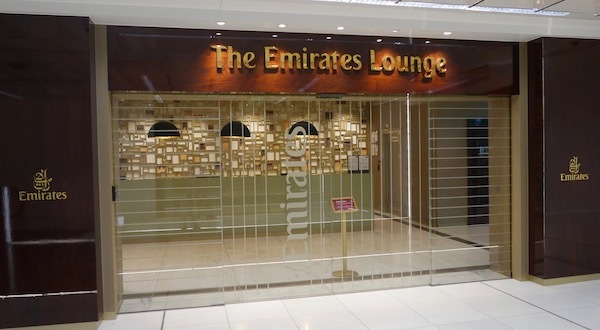 Normal operating hours is from 6:00AM until midnight daily except Thursdays where it opens early at 3:00AM to accommodate guests flying on Philippine Airlines PR208 which departs at 4:40AM. 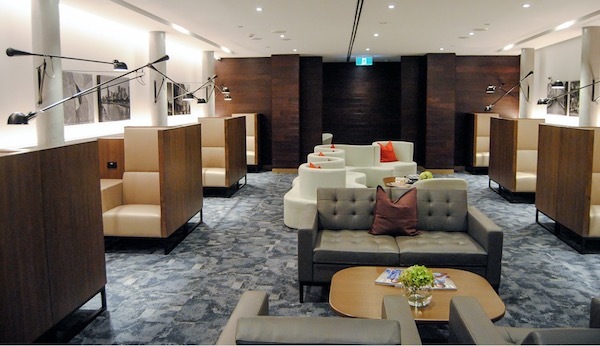 The lounge occupies the old United Airlines space. 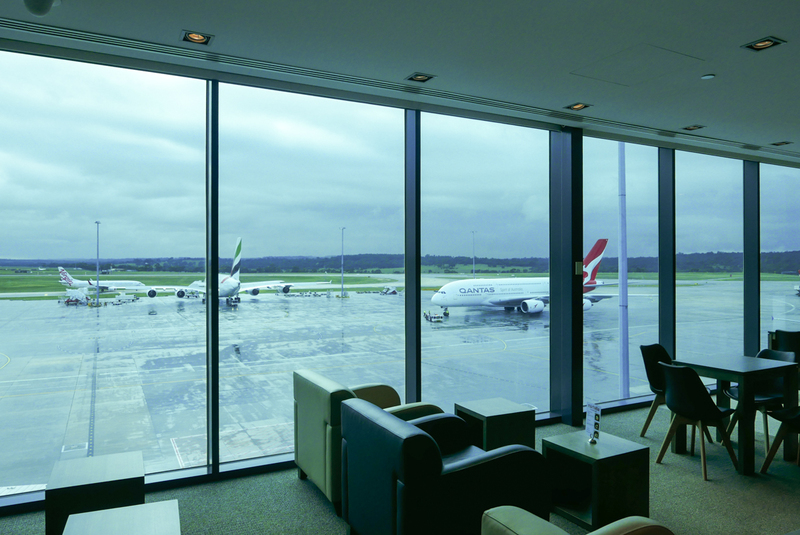 Located upstairs, it has plenty of natural light and great views, rivaling the Qantas First Class, Emirates Business & First Class and Etihad lounges. 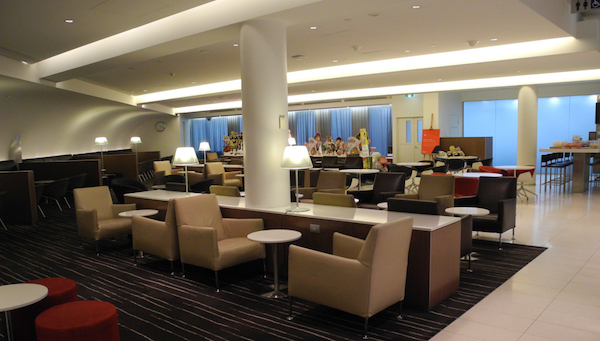 The lounge is spacious and can accommodate up to 200 guests. 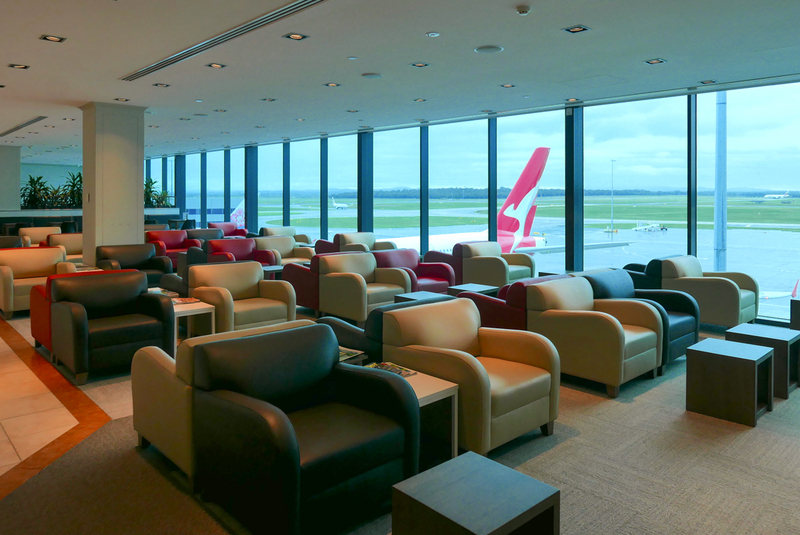 Unlike many other lounges though, there is no separate area made available for a kids zone. 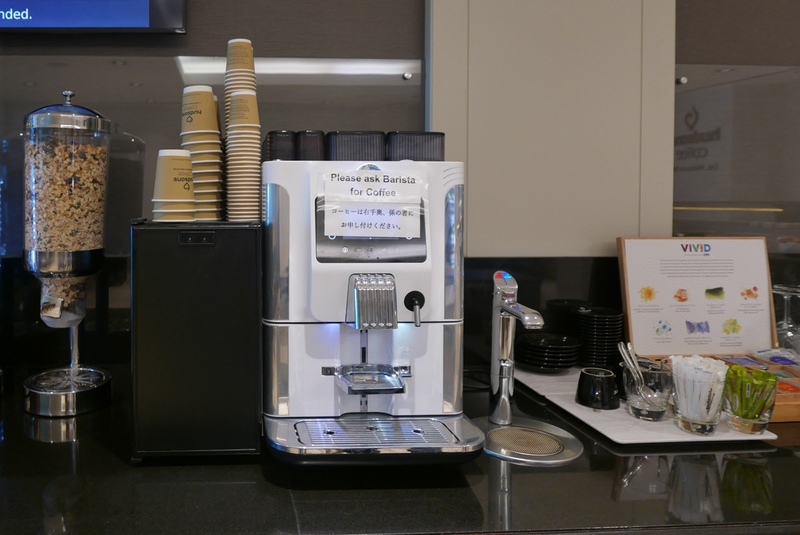 Upon entering the lounge, you have two options, you can turn right where you walk along a long corridor with arm chair seats or go straight ahead and access the dining room and barista coffee station. 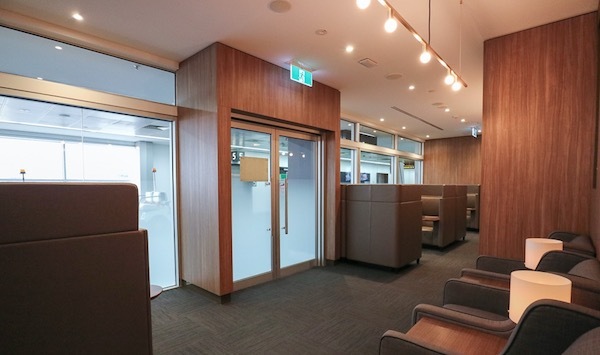 At the end of the corridor, there are more seats. 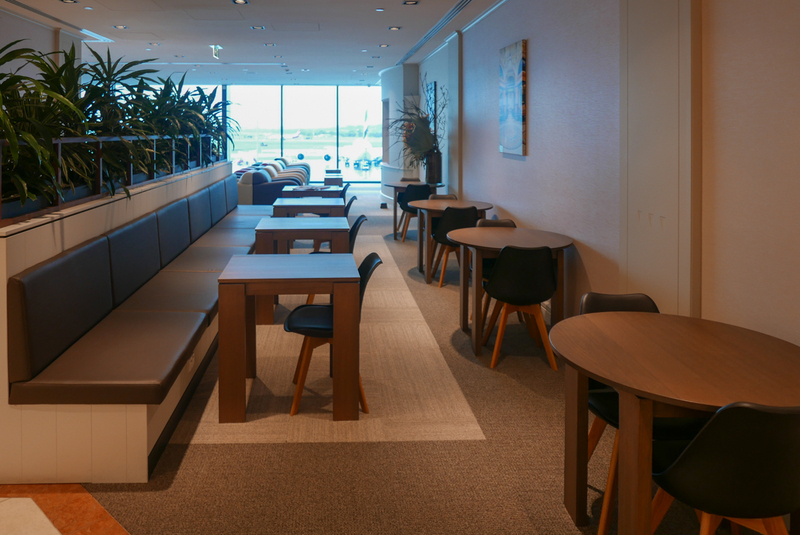 Turning left leads you to even more seats, as well as the bathroom and a large empty room that was once the Business Centre. 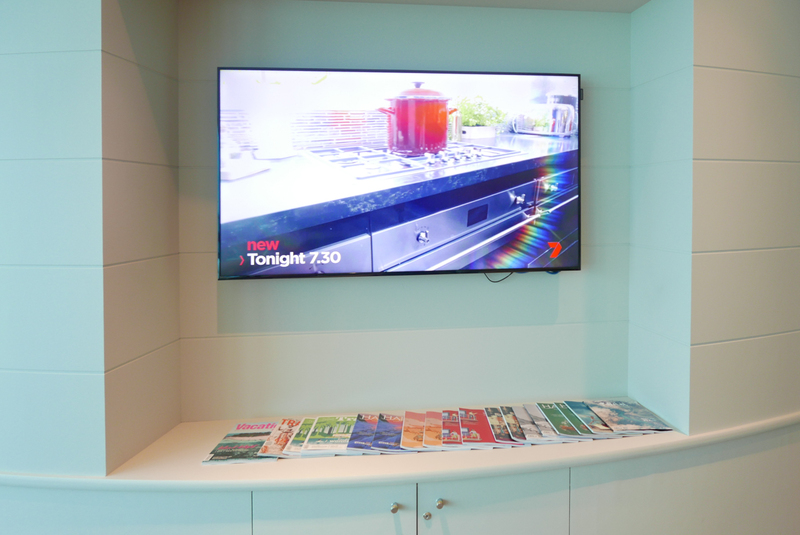 You eventually reach the dining room by which time you have almost done a full circle of the lounge. 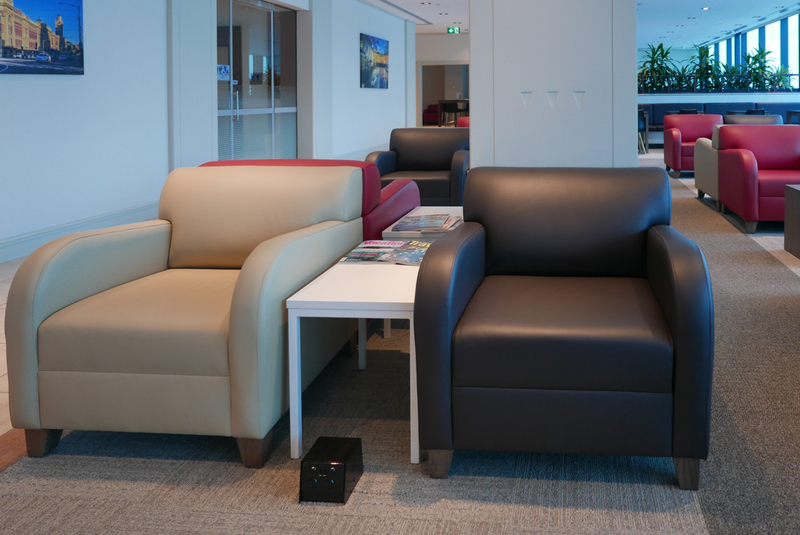 Every seat has access to a power outlet and UBS charging port, which comes in handy when you’re running low on battery power. 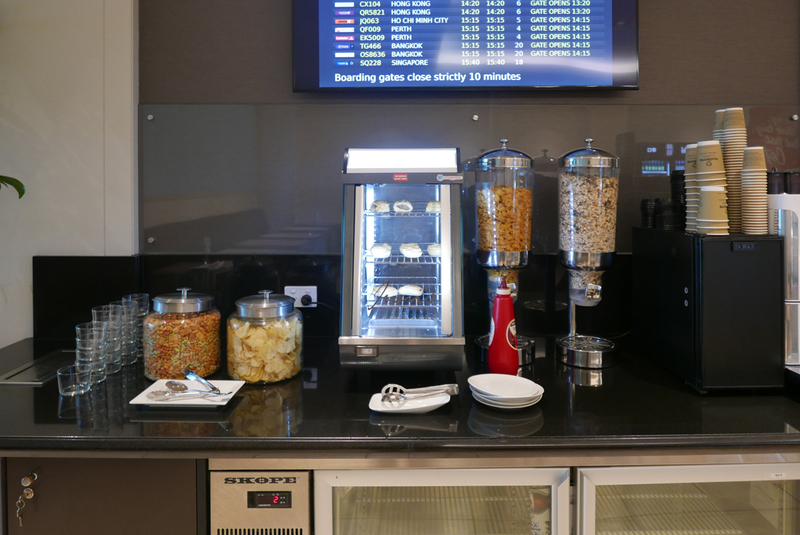 The décor of the lounge is quite bland, which takes away from the overall ambience of the lounge, especially when compared to the Plaza Premium lounge for example. 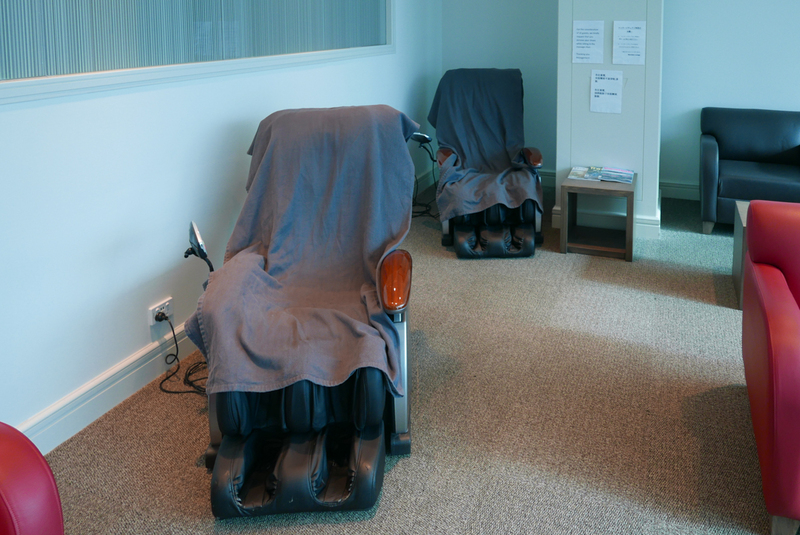 However, a welcome feature of the seating is the inclusion of two electric massage chairs, which can especially come in handy when connecting between medium and long-haul flights. 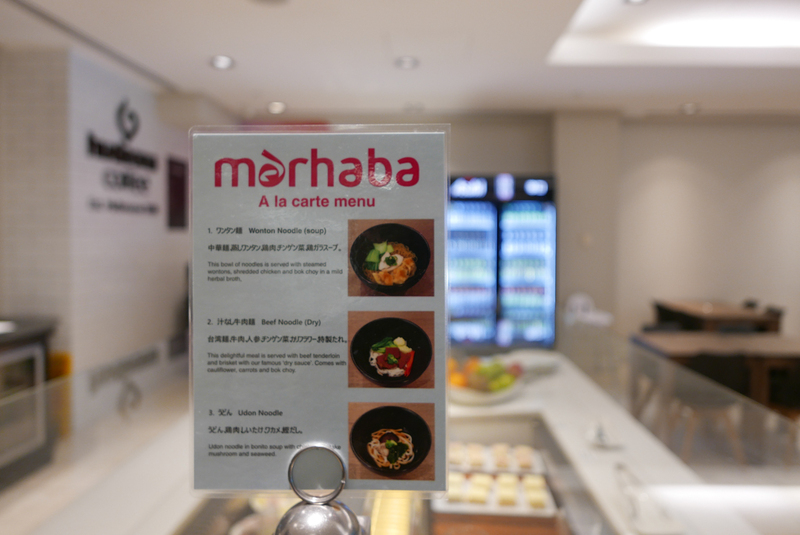 This is where the Marhaba lounge excels, with six hot food options along with a la carte noodles station, offering wonton, beef and udon noodles. 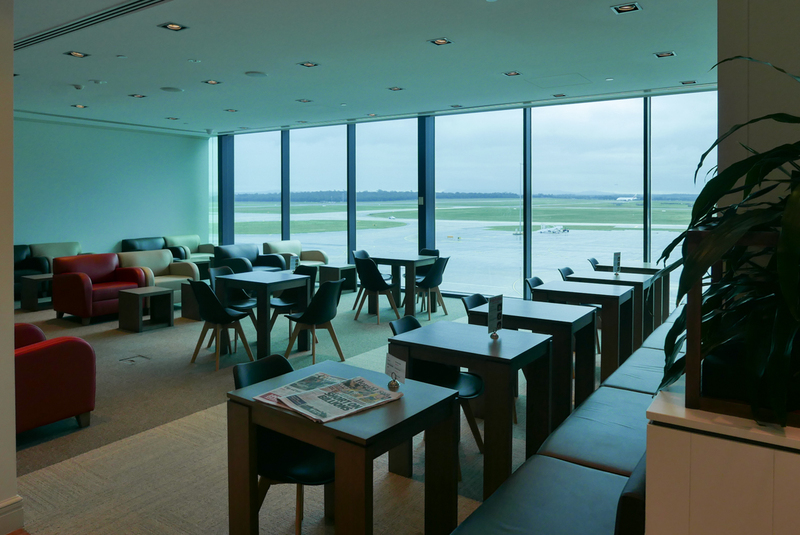 The menu is skewed towards Japanese and Asian cuisines, which is understandable given that predominantly Asian carriers make use of the lounge. 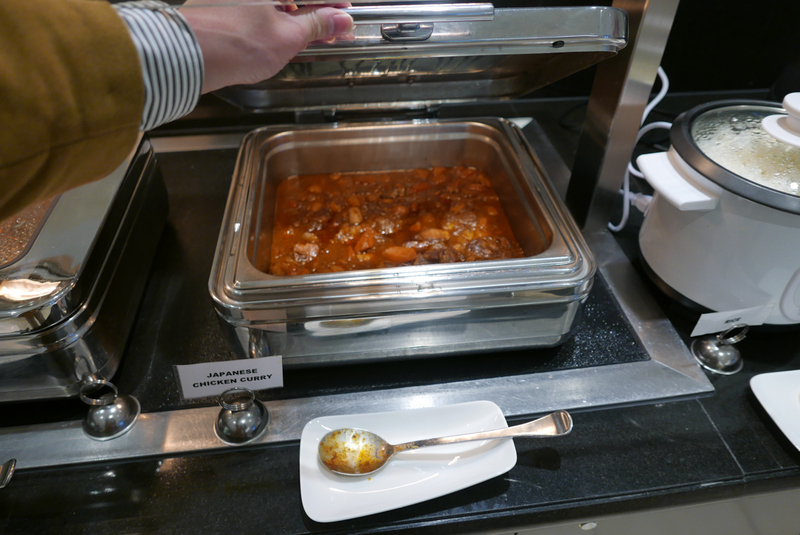 During our visit, the buffet had roasted rosemary potatoes, fried rice, roasted vegetables, Japanese chicken curry, stir sesame beef and minestrone soup. 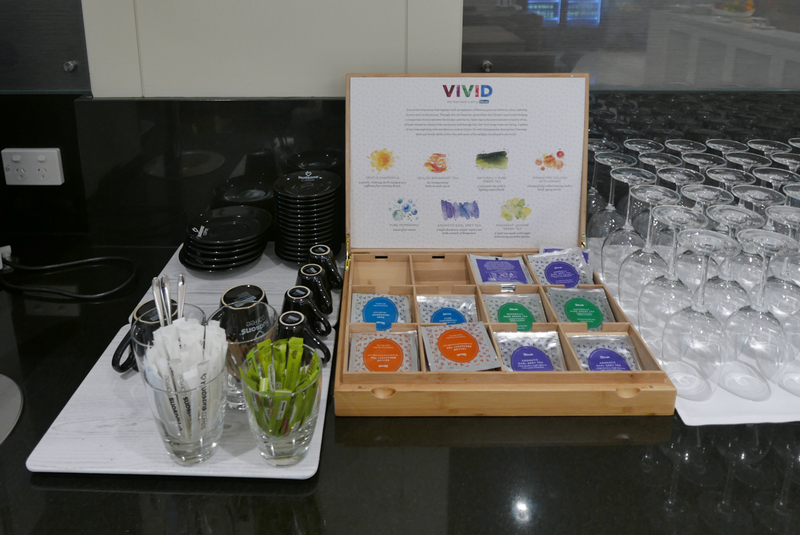 There were also prepared cheese platters and pre-mix salad bowl. 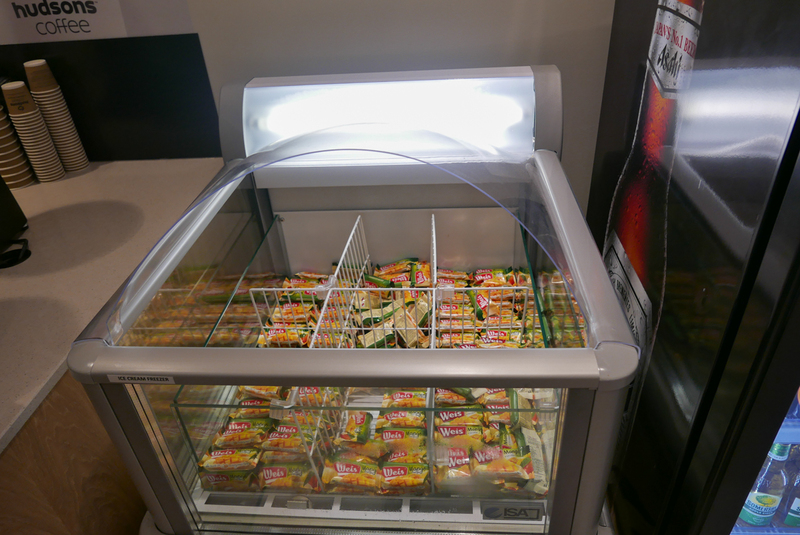 Dessert included Weiss mango ice cream, raspberry cheese cake and normal cheese cakes. 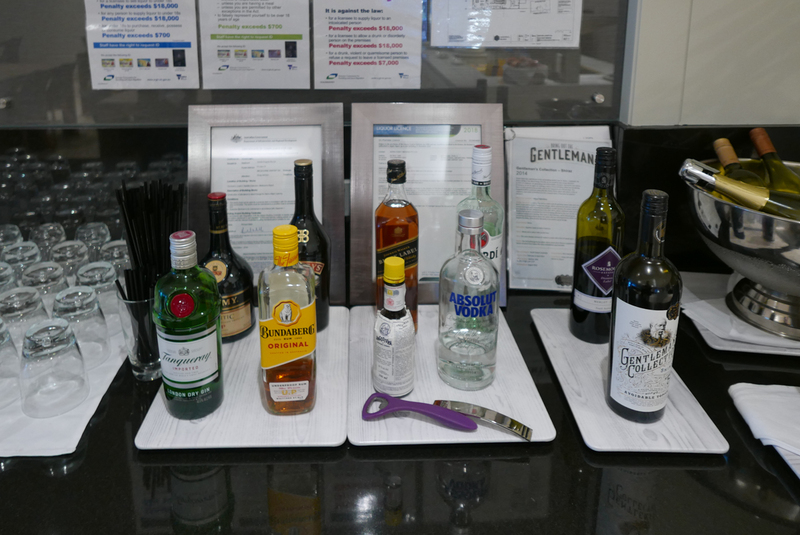 There is no bar in the lounge, but guests can use the self-serve station, which includes five spirits, two bottles of red wine, five variety of juices and six different brews of beer to choose from. 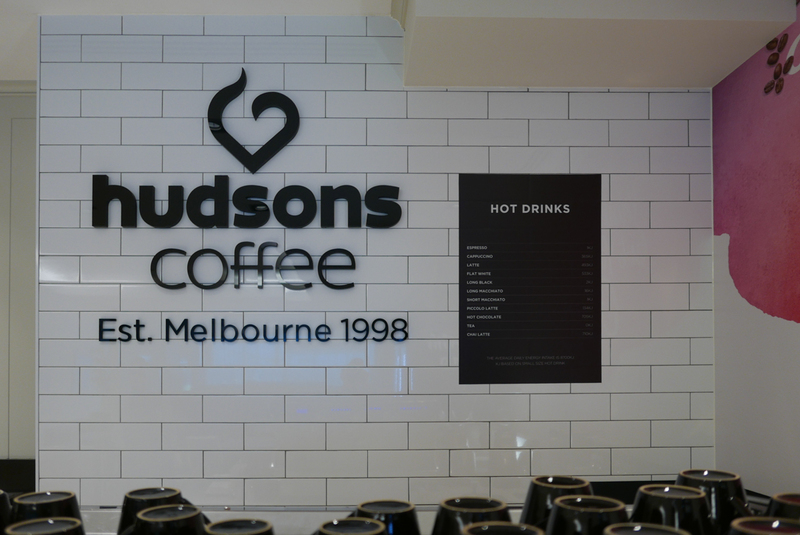 A barista service operated by Hudsons coffee is available within the lounge however. 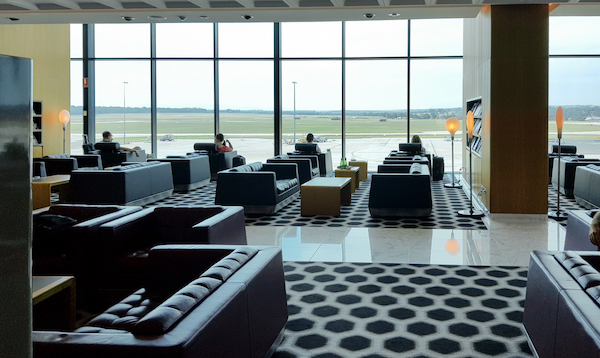 Notwithstanding the fact that the lounge was refurbished by Marhaba, a number of legacy United Airlines facilities remain and are beginning to show their age. The toilets were clean, but the perfume they used was quite overpowering, a warning to anyone who can be allergic to strong scents. During our visit, the shower was dirty with visible thick soap scum and grime on the shower wall tiles and base. 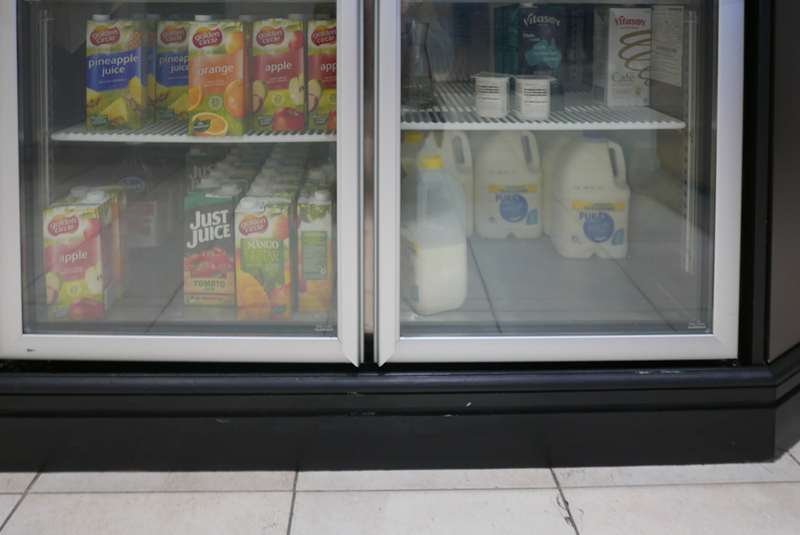 Hopefully this is an oversight by the cleaning crew and not a regular occurrence. The Wi-Fi speed was decent, download/upload 18.4mbps/19.17mbps. 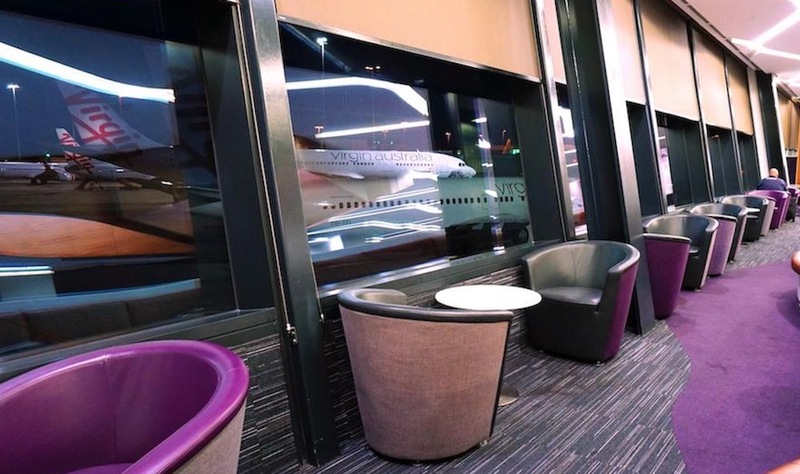 By class of travel: Business class guests travelling with Japan Airlines, Royal Brunei, Hainan, Beijing Capital, Philippines Airlines, Tianjin and Xiamen Airlines. 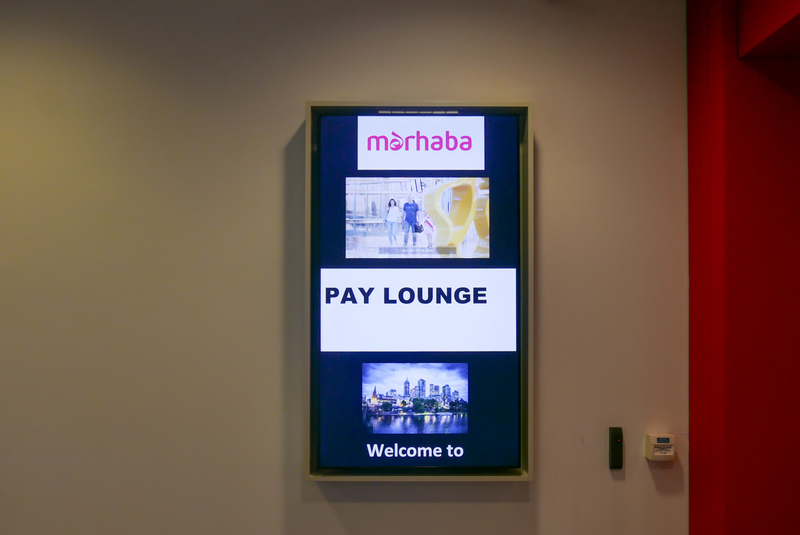 By day pass: User pay lounge, $65 per adult, $35 per child. 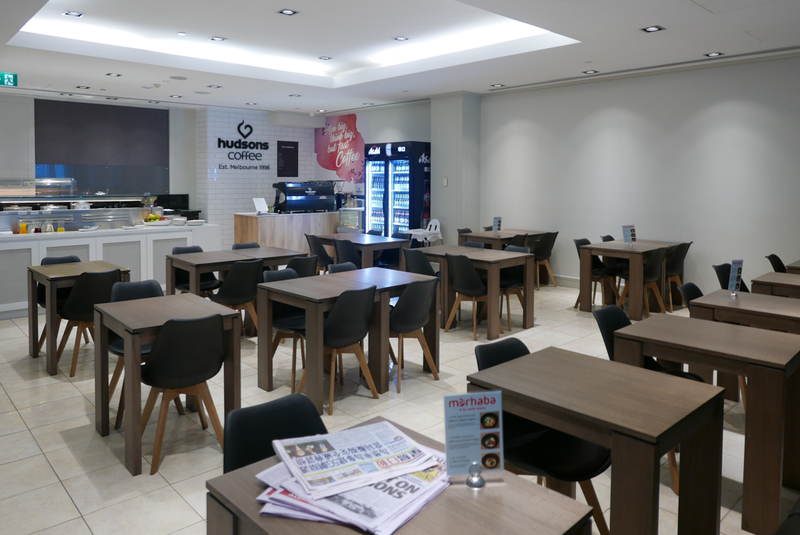 The lounge meets the expectations for a user pay lounge, with a good variety of catering options, comfortable seats and good Wi-Fi speed to work. 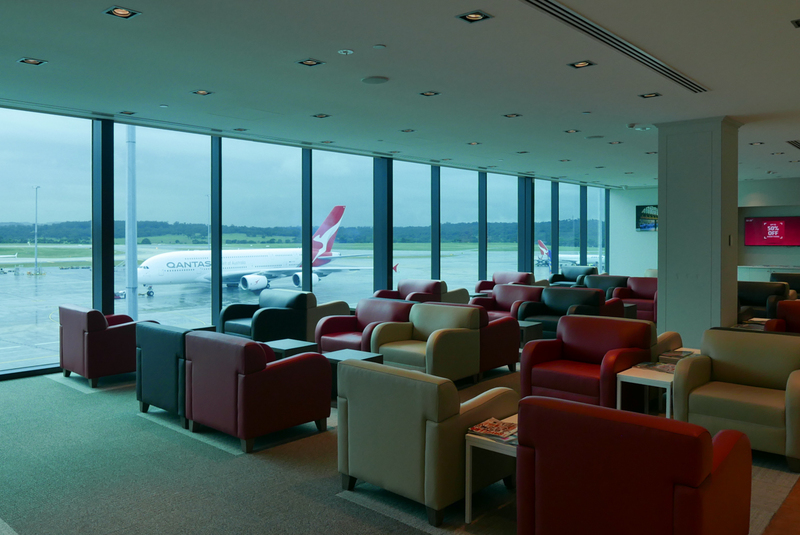 Arguably it is better than some airline operated lounges in Melbourne Airport. 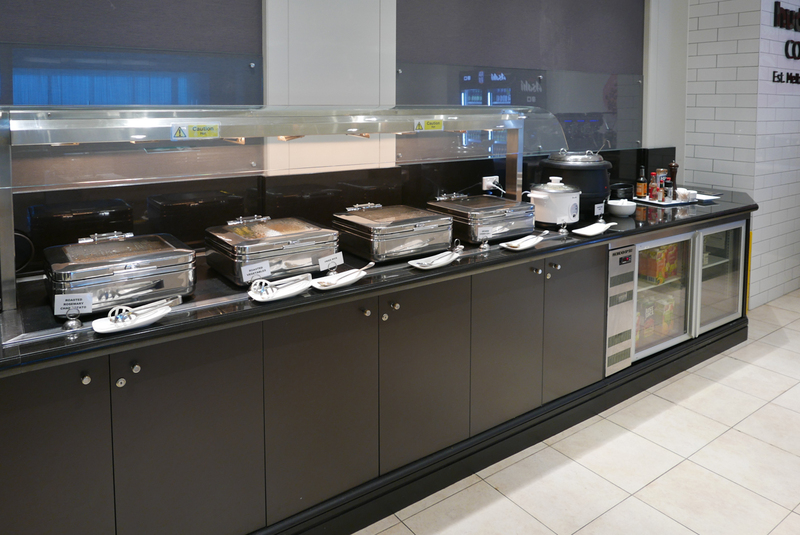 While individual taste will always come into play, we felt that the décor lacked warmth and ambience. 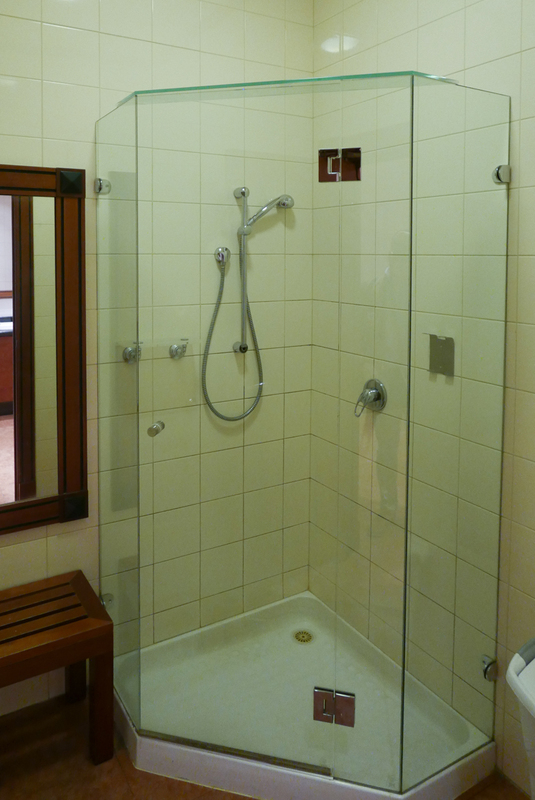 We could not ignore the fact that the showers were dirty when we visited, and this has been reflected in our rating. 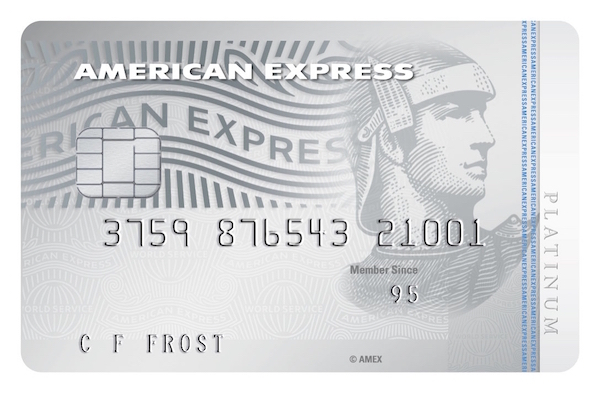 However, we would happily revise our rating if we can determine this was a one-off oversight. 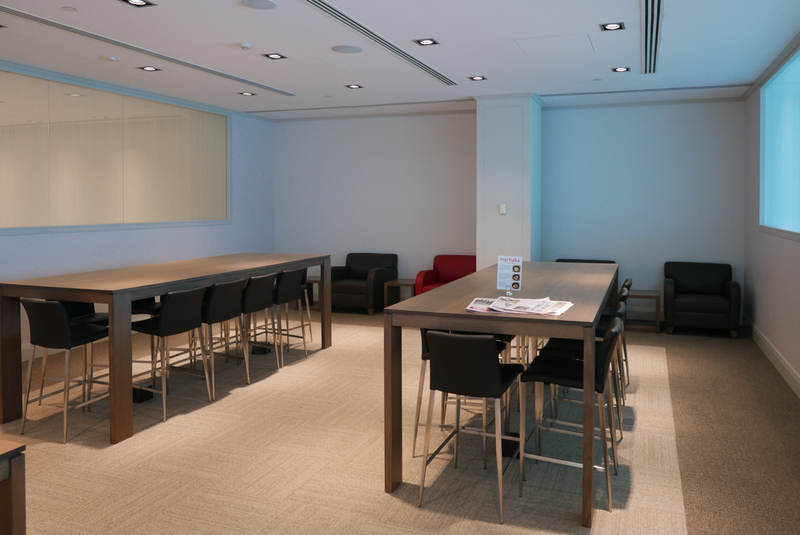 Power outlets and USB port for every seat, except the dining room. 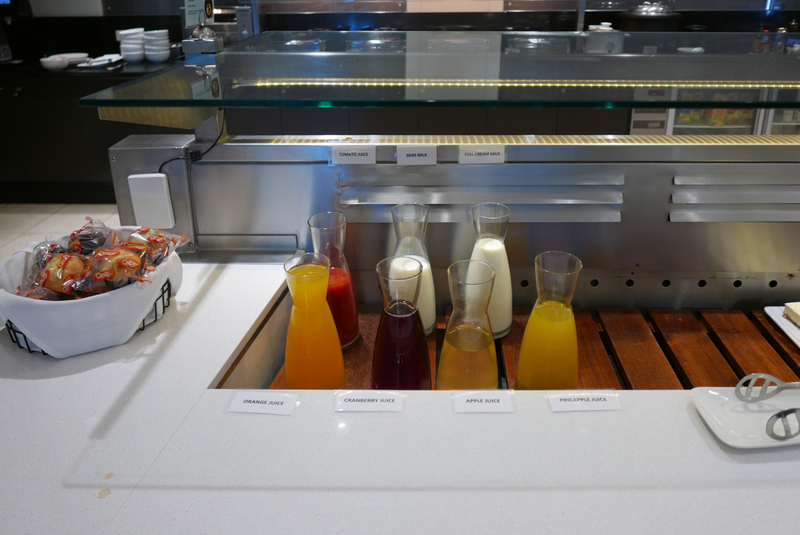 No bar and only five spirits on offer. 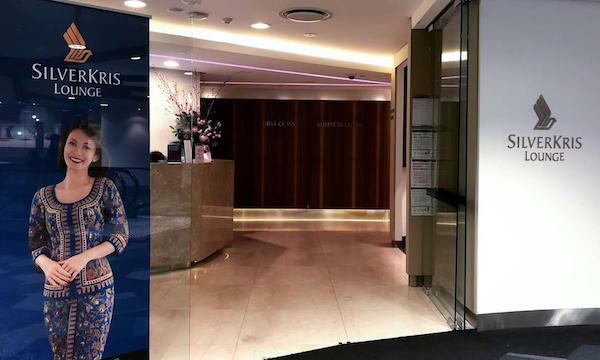 Hotel Grand Windsor Auckland, MGallery by Sofitel was recently added to AccorHotels group. 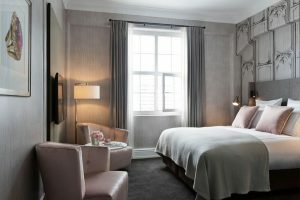 Newly opened in a heritage building in the heart of Auckland, the fittings are luxurious, but some of the rooms are small.